We have been on the road now since June, and it is hard to believe that our summer expedition is coming to an end. We have enjoyed every minute of the journey—from the mammals we’ve seen and studied to the people we’ve met through our tiny home. Over the last few months, we have had the opportunity to interact with so many people interested in learning about and contributing to our mission, and we hope to continue to share our experiences as we travel to our next destination. Throughout our studies, accomplished with the Mingan Island Cetacean Study (MICS), we have had the opportunity to observe so many amazing animals. 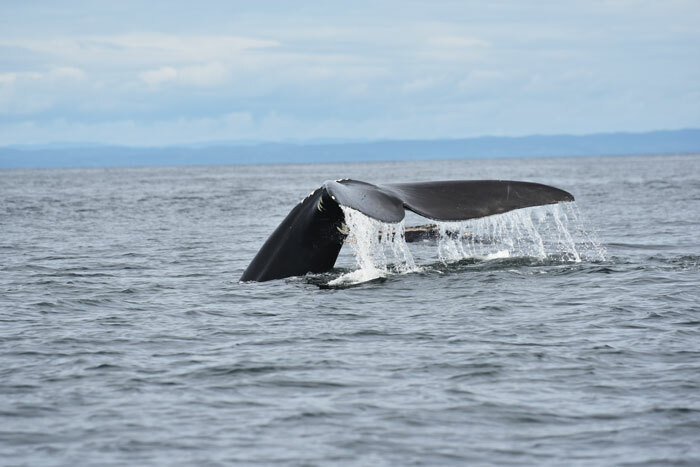 These include several hundred harbour porpoises and grey seals, over 100 minke whales, 85 humpback whales and 75 fin whales. We even spotted Atlantic white-sided dolphins on two separate occasions. On our second sighting, there were at least 100 dolphins jumping out of the water! We also observed six blue whales—one of which hadn’t been sighted in 20 years! Lastly, we spotted over 20 different North Atlantic Right whales—which makes for a record-breaking year observing this species, as only approximately 500 remain of this endangered population. After decreasing reports of whale sightings on the north shore of the Gulf of St. Lawrence, we decided to pack up and hit the road with our tiny home in order to follow the seasonal movements of the whales. We’ve landed in Rimouski, a medium-sized town situated right at the mouth of the Rimouski river. We have heard reports of whale sightings in the area, which is an estuary of the Gulf of St. Lawrence. One of our collaborators believes around 15 blue whales (an endangered species), have made these waters home for the time being. We plan to stay here for the fall, and in spite of the cold, windy weather, we hope to get out on the water several times to study these animals. 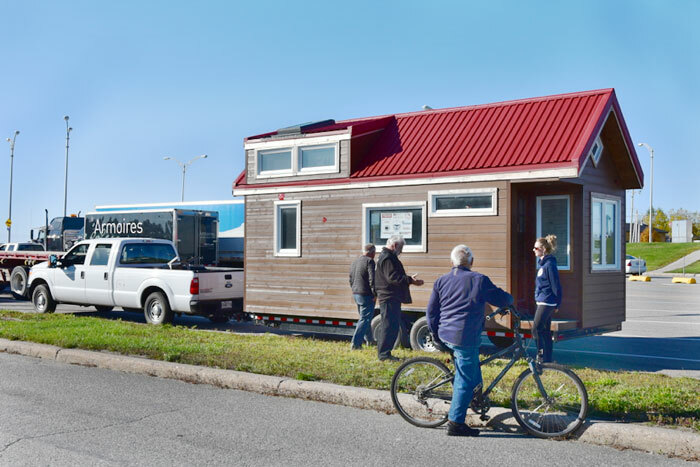 Our tiny home has been immensely helpful in our journey and we were able to achieve our goals, including accomplishing our research and reducing our personal impact on the environment. We made a considerable effort to use products that are eco-friendly, however, if we could have changed one aspect of the build, we would have loved to use salvaged framing wood and plywood to reduce our impact even further! Within the next few months, we are hoping to have our photovoltaic system fully functional to provide clean energy to the house as well. Utilizing the tiny home as a mobile research base worked even better than we anticipated. We were able to carefully plan the route and traveled 957 miles this summer! Having the freedom to move our research base whenever necessary was a great help in tracking these highly mobile mammals. We want to take this time to once again thank our generous sponsors! Without them, this journey would not have been possible. To learn more about the Atlas EnergyShield® product used in the build, visit atlasroofing.com.